Today was my day to be a guinea pig, and it looks like I’ve got what it takes. I was at the HeartMath Institute in the Santa Cruz foothills of California (on the day of a raging forest fire only 20 miles away – was that an omen?) to meet with some pioneers of energy medicine. Dr. Rollin McCraty and his team are the folks who proved that a novel heart-centered meditation process has a different effect on heart rhythm and nervous system function than seemingly similar processes like muscle relaxation or mindfulness meditation. Their theory goes one step further than describing this mind/body interaction. They believe that mental focus on emotions like compassion and appreciation alters the heart’s rhythm and also creates a magnetic field that is strong enough to affect nearby living things. Because they’ve studied the mathematics of these cardiac effects, they’re called the HeartMath Institute (www.heartmath.com). 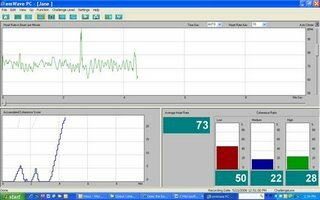 The HeartMath researchers have done a few individual demos to illustrate these field interactions, most famously showing that a boy in heart coherence can entrain the rhythm of his dog’s heart (heart coherence is their term for a heart rhythm that’s optimally synchronized with the nervous system). But nothing on a larger scale has ever been done, something of the sort that might validate our JoS theories about how crowd energy influences team coherence. So I proposed a test for the HeartMath people, to see whether a group of people focused on their inner sense of appreciation could affect the physiology of a test subject – namely me. I took a seat in their lab, and was hooked up to their computer system that monitored my heart rhythm. I then used my rudimentary skills in heart coherence (5 minutes of previous practice) to try and enter that magical state of coherence. I was then joined in the room by 6 other people who were highly skilled in the art of heart coherence, to see whether my rhythms became entrained via sympathetic resonance with their magnetic fields, the same way that tuning forks resonate with each other. The kicker in this setup was that I was blindfolded and ear-plugged. That way, I wouldn’t know when the other meditators joined me in the room, and my conscious expectations and reactions wouldn’t be a factor affecting my physiology. The only change in the situation would be my exposure to their group “vibe”; any changes in my heart rhythm would result from having been “tuning forked” by the meditators. And so, with help from Chief Scientist McCraty, the room was set up to allow me to meditate in my own little cocoon of sensory isolation, surrounded (as shown in this photo) by some pretty impressive equipment for psychophysiologic monitoring (the gizmos reminded me of the infamous Monty Python scene in “The Meaning of Life”, when the hospital administrator is duly impressed his encounter with “the machine that goes ‘Bing!’ “). As luck would have it, our experiment actually worked. Midway through my 10 minute trial meditation, I began to feel a sort of lightness in my chest. After an involuntary sigh of relief, I settled into a nice inner state of heartfelt appreciation and gratitude for way my life was unfolding. It was the state I had been striving for earlier, but it suddenly seemed much easier to enter. Amazingly enough, and unbeknownst to me, the computer monitor showed that at the very same moment, my heart rhythm (or my heart rate variability, to use the technical term), entered a state of high internal coherence, to match the rhythm of the HeartMath meditation team. The team’s pulsating magnetic field had apparently pushed me into a state of higher coherence than I could achieve by my own independent efforts, and the machines had captured this event. The photo here shows the computer monitor, with the graph in the lower left corner showing the degree to which my heart is in a coherent pattern – a few blips at first, and then zooming up off the charts.The upper graph shows my actual heart rate, in beats per minute, throughout the 5 minute experiment. The sudden uptick just past the two and a half minute mark represents the moment when the team entered the room; I remember feeling a swish of air as they walked by, and getting nervous that “it” might now be starting. Close scrutiny of the bottom left chart shows that my upsurge in coherence begins a little over three minutes into the test; in other words, just around the time when the group would have finally settled into their own coherent groove. Dr. McCraty and I were both blown away by the size of the effect we’d produced, because the demo clearly showed that a small group of people holding a positive intention can affect the physiology of one person in their vicinity. It seems obvious, then, that if 35,000 people are focusing positive vibes on their favorite player in a coordinated way, his performance could be lifted into the stratosphere. As Dr. McC. noted, the emotion of appreciation is the most powerful emotion to use for influencing others. It’s even more powerful than the emotion of anger, though maybe not as popular among fans. He said that fans could use appreciation to lift their teams when they’re in a slump, but they shouldn’t waste their emotional energy on booing their opponents. Booing disrupts everyones’ vibe, and brings everyone into an unsynchronized state. It’s far more beneficial to use fandom’s emotional energies to encourage their own team by showering them with love, kindness and appreciation. Come to think of it, we could all benefit from that kind of emotional outpouring. I didn't realize you had ever been "tuning forked"!